Cincher - Corseted...for Everyone's pleasure! Our most simple, and our most inexpensive, but in no way a lesser corset! It is the base from where we build all of our designs. This playful corset can be worn with just about anything. From jeans to skirts, to even over that "little black dress" this gem can spice up any outfit! Cinchers come standard as an Under bust but can be made with a full bustline. In Addition, the hoods and collars can be added to any style. Made with American and German Spring Steel boning, along with quality fabrics, makes this an accessory that you'll want to wear again and again. Since its double sided, or reversible, it can match twice as many outfits! Because each of our corsets are hand made, we like to handle everyone's wants and needs personally. 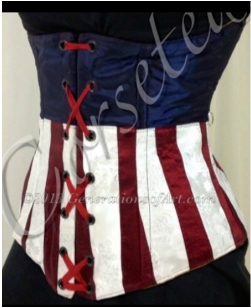 If you are interested in a custom corset from us, please fill out the following forum with as much detail as possible so that we may best contact you with an assessment and a price quote for your perfect custom! We will usually contact you within 48 hours, however, due to travel and shows it may take up to 4 days. Actual production time is 8-12 weeks, during non peak season. Additional charges will be added for rush orders. Only US orders at this time.